1. Assessment in GST is mainly focused on self assessment by the taxpayers themselves. Every taxpayer is required to self-assess the taxes payable and furnish a return for each tax period i.e. the period for which return is required to be filed. The compliance verification is done by the department through scrutiny of returns, audit and/or investigation. Thus the compliance verification is to be done through documentary checks rather than physical controls. This requires certain obligations to be cast on the taxpayer for keeping and maintaining accounts and records. 2. 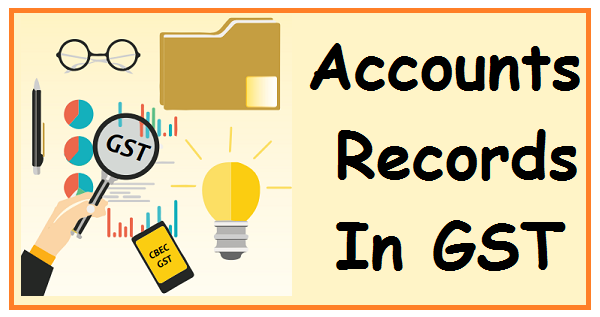 Section 35 of the CGST Act and “Accounts and Records” Rules (hereinafter referred to as rules) provide that every registered person shall keep and maintain all records at his principal place of business. It has cast the responsibility on the owner or operator of warehouse or godown or any other place used for storage of goods and on every transporter to maintain specified records. The section also empowers the Commissioner to notify a class of taxable persons to maintain additional accounts or documents for specified purpose or to maintain accounts in other prescribed manner. It also provides that every registered person whose turnover during a financial year exceeds the prescribed limit shall get his accounts audited by a chartered accountant or a cost accountant. (b) supplies attracting payment of tax on reverse charge along with the relevant documents, including invoices, bills of supply, delivery challans, credit notes, debit notes, receipt vouchers, payment vouchers, refund vouchers and e-way bills. 4. In case more than one place of business is specified in the certificate of registration, the accounts relating to each place of business shall be kept at such places of business. A registered person may keep and maintain such accounts and other particulars in electronic form in such manner as may be prescribed. 6. The books of account shall be kept at the principal place of business and at every related place(s) of business mentioned in the certificate of registration and such books of account shall include any electronic form of data stored on any electronic devices. The data so stored shall be authenticated by way of digital signature. 7. Any entry in registers, accounts and documents shall not be erased, effaced or overwritten and all incorrect entries, other than those of clerical nature, shall be scored out under attestation and thereafter the correct entry shall be recorded and where the registers and other documents are maintained electronically, a log of every entry edited or deleted shall be maintained. Further each volume of books of account maintained manually by the registered person shall be serially numbered. 8. Period for preservation of accounts: All accounts maintained together with all invoices, bills of supply, credit and debit notes, and delivery challans relating to stocks, deliveries, inward supply and outward supply shall be preserved for seventy two months (six years) from the due date of furnishing of annual return for the year pertaining to such accounts and records and shall be kept at every related place of business mentioned in the certificate of registration. 9. Electronic Records: The following requirements have been prescribed for maintenance of records in electronic form. 10. Records to be maintained by owner or operator of godown or warehouse and transporters: The transporters, owners or operators of godowns, if not already registered under the GST Act(s), shall submit the details regarding their business electronically on the Common Portal in FORM GST ENR-01. A unique enrolment number shall be generated and communicated to them. A person in any other State or Union territory shall be deemed to be enrolled in the State or Union Territory. 11. Every person engaged in the business of transporting goods shall maintain records of goods transported, delivered and goods stored in transit by him and for each of his branches. Every owner or operator of a warehouse or godown shall maintain books of accounts, with respect to the period for which particular goods remain in the warehouse, including the particulars relating to dispatch, movement, receipt, and disposal of such goods. The goods shall be stored in such manner that they can be identified item wise and owner wise and shall facilitate any physical verification or inspection, if required at any time.